Brakes are very important for any vehicle and heavy vehicles generally uses friction brakes along with Electromagnetic brakes. This project mainly focus on constructing a braking system, which can be applicable in two wheeler at high speed and low maintenance cost. This system uses an electromagnetic coil and a plunger. There is an electromagnetic effect which moves the plunger in the braking direction. Electromagnetic brakes are also called electro-mechanical brakes or EM brakes and slow or stop motion using electromagnetic force to apply mechanical resistance (friction). You can also Subscribe to FINAL YEAR PROJECT'S by Email for more such projects and seminar. 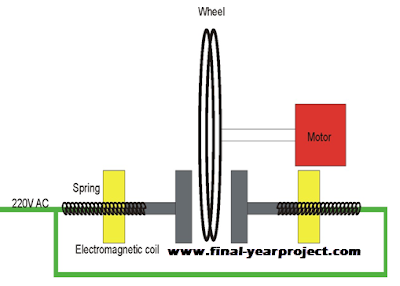 Working of electromagnetic brakes is really very simple and we know that when electricity is applied to the field, it creates an internal magnetic flux and that flux is then moved to a hysteresis disk passing through the field. The hysteresis disk is connected to the brake shaft. A magnetic drag on the hysteresis disk allows for a constant drag, or eventual stoppage of the output shaft. It was found that electromagnetic brakes will develop a negative power that represents nearly double the utmost power output of a typical engine, And a minimum of thrice the braking power of an exhaust brake. These performance of magnetism brakes build them far more competitive candidate for various retardation equipments compared with alternative retarders. 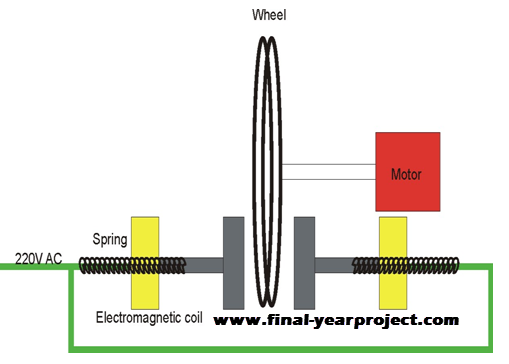 This project report explains about different aspects of electromagnetic brake system and is divided into several chapters like general principle of brake system, conventional friction brake, how ordinary (friction) brakes work, “brake fading” effect, retarders, construction, general principle and advantage of electromagnetic brakes, working principle, electric control system, types of electromagnetic brake, characteristic of electromagnetic brakes, thermal dynamics, merits, dermirts & application. Use this report for your reference and study work.